You know that thing where people tell you what they really think of contemporary music? A few weeks ago, someone close to me asked if I was “going for R2D2 or BB8” in the excerpts I previously posted. Star Wars robots in a piece about 3D brain space?? Obviously this is a problem! She was half-kidding and certainly wasn’t trying to be negative, but I found her honest opinion of the sounds I had created refreshing and very helpful. It drove me to make some detailed changes to the throughout the entire electronic track, and to create some new, more distorted sonic materials with my existing methods. I still consider the sine tones, and many other sounds in the piece, to be crucial material for the concept behind it, but I figured there must be a way to improve the impression they make. Once I had settled on sounds that felt less recognizable, I folded them into the preexisting texture, with the hope that the increased complexity makes it sound less like a cute robot happens to be in the mix. neuron grains, spatial vibrations, inharmonic sine tones – and also a string quartet! There is so much wonderful instrument(s)+electronics repertoire in which acoustic and electronic sounds are continuously interwoven, each part of one set of musical ideas. I wanted to take a different approach in this piece, however, for the sake of representing both commentary and conflict. 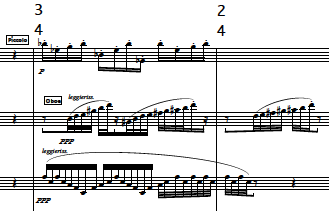 The quartet and the electronic playback are resolutely independent musical worlds, each overlapping with the other for only portions of the piece. The quartet is meant to provide commentary on this crazy neurological space. There are a few bridges between acoustic and electronic; these include the transcribed rhythm of neuron pulses that appears in the quartet part (page 3, bar 36, vla and elsewhere) and ephemeral string samples in the electronics. But the quartet – particularly towards the end – becomes a refuge external to the electronics as it flirts with consonance and tonality. 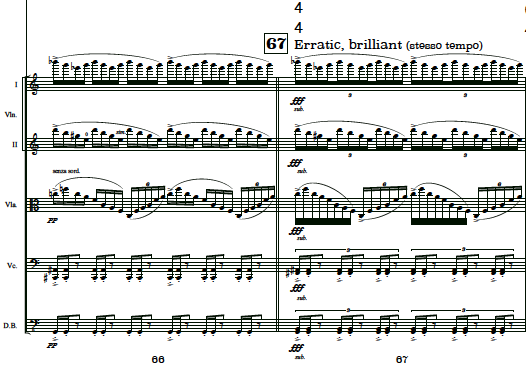 Some quartet score excerpts are here. I’d love to hear what you think! I’m very excited for Access Contemporary Music‘s performance of the has-been to beachey at the Ear Taxi Festival this Saturday! A good portion of Carl Sandburg’s work is characterized by deep reflection on rough, visceral urban images. He’s almost always an observer – even a passer by – standing in either awe of or disbelief at what he’s seeing. What’s most striking to me, however, is the indifference of these crude realities to Sandburg’s moments of introspection. the has-been to beachey tries to capture this with a tapestry of images from two of his more mysterious poems: “The Has-Been” and “To Beachey, 1912”. These two poems don’t actually include these rough images from urban Chicago, but I still designed the piece around this concept. There’s still some clear musical documentation of images: a frantic horse ride, a strange shadow. But the violin and cello quickly veer into indifference: the voice grandiosely professes a “love of the big blue beyond”, but the strings respond with quiet, mechanical plucking sounds, and then with highly distorted, faraway swing cabaret rhythms that unravel and disappear. The voice does passionately reasserts itself (“only a man…”), and the strings join in, emphatically romanticizing Sandburg’s experience, then continuing with some lyrical introspection. “The boy laughs and goes whistling: ee-ee-ee ee-ee-ee. I’m so thrilled to announce that Killing the Goat, my opera based on Mario Vargas Llosa’s La Fiesta del Chivo, has been selected for Fort Worth Opera’s Frontiers Program in May of this year! A press release is available here.